If you are someone who loves to be creative AND get paid for it, then Alice’s Table is a company you should check out. It was created in September of 2015 as a way to help busy women launch a home-based floral-arranging business. Alice’s Table is a lifestyle direct sales business that allows you the flexibility to work outside of an office in the hours that you choose. Founder Alice Rossiter created Alice’s Table in order to bring people together to learn new skills and live a creative lifestyle while getting paid to do it! The event exec program is designed for someone who either loves floral design or flowers in general. What makes Alice’s Table different from other work-at-home opportunities is you aren’t selling a product; you are selling a lifestyle and creative experience. Event execs can host either public or private events at businesses, restaurants, bars or private homes. Tickets are sold directly through the website and cost $65 per person. Private events can be arranged for showers, birthday parties and more. Alice’s Table recommends that you host at venues that can provide food, cocktails or an additional experience. There is no minimum number of attendees for a public event, and they have done events up to 50 people! The average range is 15 to 20 people per event, and each event lasts roughly 2 hours with an additional 30-minute set up and 30-minute cleanup time. Alice’s Table takes care of everything on the backend for you; they will take care of the payment process (guests process tickets directly on the main company website), customer support, platform access and more for you. The company provides each event exec with seasonal flower recipes that include arranging and care instructions. If you do want to flex your creative muscles and create your own flower recipe, you have the freedom to do so! Alice’s Table will even review the recipe beforehand to make sure it will work well for your event. You get paid after each event. No matter how long you have been with the company, you will take home a 70% commission on ticket sales before the cost of supplies. On average, the supplies (i.e., flowers, vases, etc.) cost roughly $22 per person, per event. According to their website, if you host an event with ten people attending, your average income per event is $455. With 20 people participating, you have the earning potential of $910. And if you are lucky enough to get 30 people at your event, you could earn a whopping $1365 per event! It is not particularly cheap to join Alice’s Table. The initial cost to become an event exec is $699. The reason it is much higher than other work-at-home companies out there is that you are getting items that you will reuse class after class. You will get all the reusable materials you need for a 20 person event including 20 aprons, 20 clippers, 20 rose strippers, 6 large buckets, 6 trash buckets, 5 water cans, 3 spray cans, and plant food. According to the company’s website, it takes about two or three events to earn back the startup fees. As you are getting started, Alice’s Table will provide you with four training modules and two training calls to help you learn the necessary floral, marketing, and sales skills. There are absolutely no floral arrangement skills needed before joining Alice’s Table; they teach you everything you need to know in the modules! Plus, their support line can assist you if you have any questions. None is needed as tickets are sold directly through the main website. Alice’s Table is not designed like an MLM with a bonus structure and increasing compensation based on your level of sales. Therefore, at this time they don’t have a bonus opportunity for you. However, when you do join, you are entering a community of motivated women who will support you when you need it. There is an opportunity to grow with the company as you can host weddings as well. You can offer an assisted DIY event which can be ideal for a bride who wants to create her own floral arrangement but needs a bit of help. If you are interested in hosting a wedding, you can, but you need additional training beforehand as this takes expert floral skills. You must be over the age of 18. For location, you need to have access to flower markets as you have to use fresh flowers in your business. While Alice’s Table can help you order flowers and ship them directly to your house, there is no guarantee that they will stay fresh. You also need to have sufficient space to store the flowers. You will receive the flowers the day before the event, and they need to stay fresh. They recommend you keep them in a cool, dry, dark place. If you don’t have a good place to store the flowers, then you should reconsider this direct sales opportunity. Alice’s Table is a unique company that is growing quickly. Founder Rossiter recently appeared on an episode of Shark Tank and received a $250,000 investment from Mark Cuban and Sara Blakely, who now own 5% of the company. The investors were intrigued by her vision of other “business in a box” ideas, helping to spread entrepreneurship across the country. After the episode aired earlier this year, the company reportedly saw a huge increase in women signing up for the event exec program. Between when she filmed the episode of Shark Tank and when it aired, she went from 53 executives to about 120. 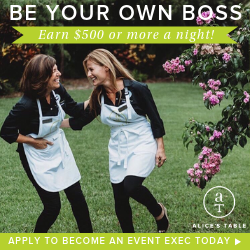 If you want to join in a business that is taking off, check out Alice’s Table. You can expect that this is a business that will continue to grow fast and will continue to add new services to their business. Click here to learn more about Alice's Table.